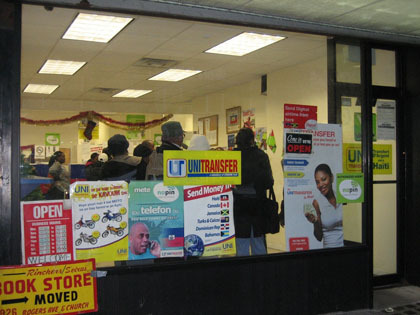 Haitians in Flatbush stood in line at the UniTransfer money transfer service on Tuesday afternoon, waiting to send funds to relatives and friends trying to survive in the aftermath of the massive earthquake that hit the Caribbean nation a week before. Family and friends of the victims have been trying to send money, though it has not been easy. As numerous money transfer buildings and services crumbled to the ground in the capital city of Port-au-Prince and neighboring villages, Haitians living in Flatbush were forced to wait a week to send funds to their relatives via wire services such as UniTransfer on Church Street. The money would be used to buy basic needs such as food and water, both of which are presently scarce in Haiti. Renel Bazile, a Flatbush native, waited to be told when to send money to his relatives in Haiti. His cousins in Haiti — with whom he was able finally to make contact this Sunday — searched for a wire service that was still standing amid the rubble, and sent word back when they had finally found one. Bazile immediately headed to UniTransfer when receiving confirmation. “Here, if you want to, you send the money, and you call them to get it, and they’ll go and get it,” Bazile, 51, said. Bazile, who regularly sends money to his relatives in Haiti every other week, gave a bit more this time. He also planned to donate money to Haiti relief organizations, but knew that the wire transfer would assist his family quicker. Bettina Abellard, who stood patiently in line at UniTransfer, was of the same mind set as Bazile. She noted the money transfer could take up to “a couple of minutes” to get the Haiti. “Well, it’s going to take a while before the (charity) money is distributed in Haiti, and they need to survive before that,” said Abellard, 28, who sent $500 — about 20,000 Haitian Gourdes — to relatives in Haiti. Haitians in Flatbush provided funds to those outside their family circle. Darlene Sanon said that her neighbors, who did not have family in Haiti, sent money to friends suffering in the Caribbean. Sanon, 42, wanted to send food to her family, who were living “outside in the field, actually, the soccer field,” but due to the poor conditions, she was afraid it would not get to them. Although goods and money are being transported to Haitians in need, the prices of goods in the nation have inflated greatly. Jude Domond sent $500 to his parents and cousins in Port-au-Prince to buy food, but was wary of the prices. Despite the catastrophe and the rising number of casualties, Haitians are optimistic. Hi there! I found your blog via Google while searching about SEO.And your post looks very interesting and informative to me.